For many years even before life aboard the boat i have wanted to visit this bridge below, just check my surname and you`ll see the connection, but never got around to doing it until a few days ago. 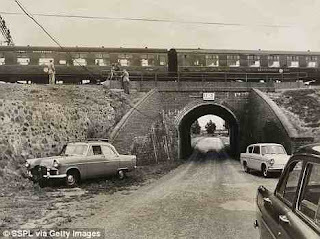 Apart from some metal fencing enclosing electrical installations and some bushes not much has changed since it was pictured 40+ yrs ago.Bridego bridge above in 2011 and below in 1963 and the scene of the Great Train Robbery where 2.6 million pounds in used notes came off the overnight mail train and down the embankment onto trucks. The train was 1st stopped across the fields from church lock and moved a short distance south almost adjacent to Slapton lock. On the map the top circle is the trains first halt, the lower circle is Bridego bridge the scene of the robbery and circled to the right is an excellent mooring very close to bridge 118 if you fancy a look. Not all the money or the perpetrators were caught but some of those captured received 30yrs. Well i`m glad i crossed that off my bucket list. towpath we grounded and spent nearly an hour back and forth until a boater from the long term moorings walked by and used my pole to get the boat into not deep but enough water to move on but even that took 20 mins. So having found the edge after the next lock just deep enough to force the boat in we stayed the night and awoke to find BW letting just enough water down to float me off and put some depth in the previous pound. This rubbish being loaded into the tipper at Wolverton is i guess the result of the IWA mid October clean up of the canal between Fenny Stratford and Wolverton. Just love this time of year with the towpath changing colour almost daily. Another sad sight so soon after the burnt out cruiser at Stoke Bruerne. This was to the north side of Milton Keynes near Linford and the guys on the towpath are doing a great job of laying a new hard surface. Now the point i`m trying to make is these are 24 hr moorings and was all that was available and as you can see we have only BW for company. We decided to make use of the local shops and get on board not just food but diy bits from BQ. We overstayed by 36hrs but the reason i did was because of those BW boats, anyway after 6yrs i got my first letter, from a mooring warden, telling me what a bad boy i was and a report is on it`s way to the local BbbbbbbbbbWwwwwwww, sorry shaking with fright, office. Anyway we moved through the lock and moored 500yds down on the 14 day moorings. It was only the fact that BW could have moored their boats there that gave me the `if it`s good enough for my landlord......` attitude. No they decided to go 500yds and through the lock to moor on the 24hr. Ok folks tell me i`m wrong if you want i`ll publish any clean comments slating me. Arriving at the last pound of the Stoke Bruerne flight the towpath has badly fallen away despite BW trying to keep the water at bay with plastic sheeting. The situation is worsened by the close proximity of the lock. I see the stoppage to repair this is listed as 30th Jan-24th Feb and is listed as a contracted heritage repair to the wall. I just hope the end of the holiday season and the reduction of traffic through the locks will stop this getting worse. Another sad sight at the same location. others had been there before but we still managed to find a large amount. As can be seen the gangplank was needed to bridge the shallow water when loading the logs. One puzzle was where had the tree come from? Behind the hedge was a narrow corner of a ploughed field and no sign of a stump or hole. My guess was the farmer had cut it down as it made it awkward for the tractor in the tight corner. Perhaps the stump was still in the middle of the field and the canny farmer knew if he dumped the tree near the canal it would save him the bother of clearing it. This picture taken soon after the wood was loaded is now out of date as today i spent a few hours cutting up another very large find. We just love to burn wood all day and keep the expensive coal for the long overnight burn. So a few days stopping as when we want is the life we love and a lot of time is still being spent doing alterations. The latest is we now have a cross bed measuring 6` x 6`. My old 4` bachelor bed was fine for just me but now we can stretch out..........bliss. We now find ourselves south of Milton Keynes and Saturday a visit from some of the grand kids (why did i not take pics) was lovely after not seeing them since May owing to our long stay in the USA. What we intended was a trip into London after loading Jaq`s boxes, awaiting customs clearance, but my worry is if it should freeze and we are unable to get past the stoppages and remain trapped till March. So perhaps a re-think on the London trip.